they go and do something that surprises you. There is something about Wednesdays that causes my children to behave badly. Lego and I had a viewing/visitation that we needed to go to. We hurried out of the house as quickly as we could, leaving several fighting-screaming-angry children in our wake. When we got home, the house was in a state of chaos. Our oldest DD was waiting at the door to lead us down to my (still in disarray) Studio. 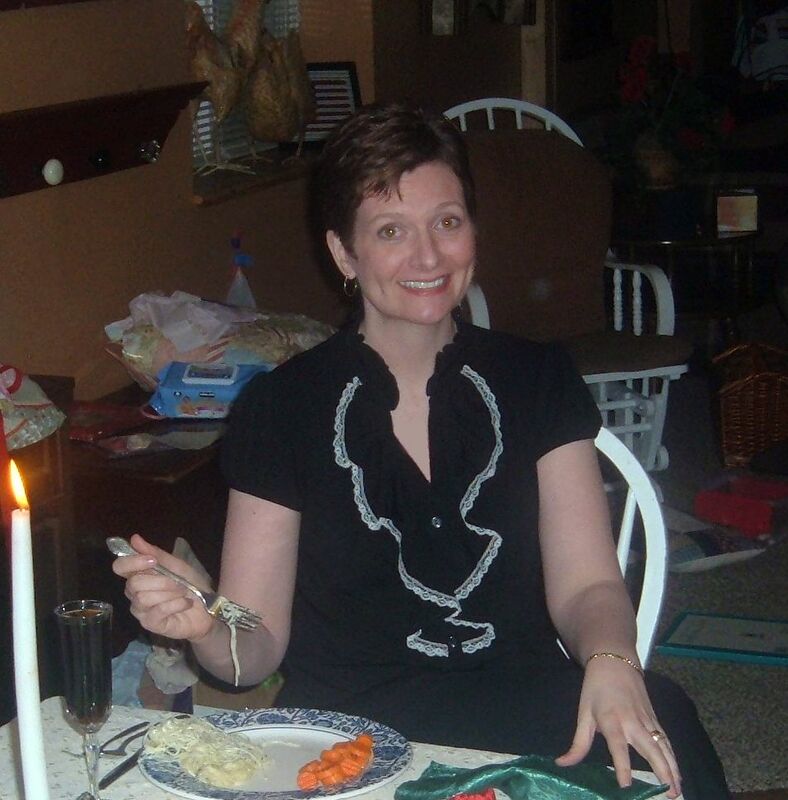 Waiting for us was a candle light dinner that they had all readied for us. They built a table out of 2 TV trays and a piece of plywood, covered by a lace table cloth. 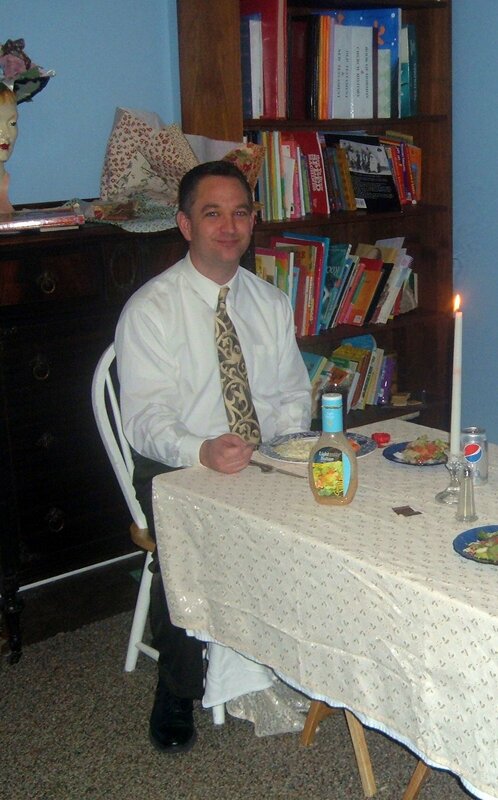 We had angle hair pasta, carrots, salad, and Diet Pepsi in our fancy glasses. We were so thankful for their thoughtfulness. They knew that we didn’t have time to go out…..so they made an “Out” for us. They even tended the little ones upstairs while we ate. and I have a renewed affection for my children too. Here is a sneak peak of Izzy and Ivy’s pattern I just finished. Does anyone know anyone that could do some pattern grading FAST?? Someone with CAD?? The Mystery Purse was so much fun, and continues to be! I love to see how the bags are turning out, and I love to hear your stories about making it. If you have any suggestions, I am open to hearing them. 1- What did you like about the Sew-Along? 2-What didn’t you like about it? 3-What should I do differently next time? 4-What should we do next time? I can’t believe it is finally here. By the end of this post, the mystery will be over. oy! The pressure! What if you hate it, and hunt me down, and beat me up with it. have I ever mentioned that I have anxiety? Step 1- Attaching other side of snap. 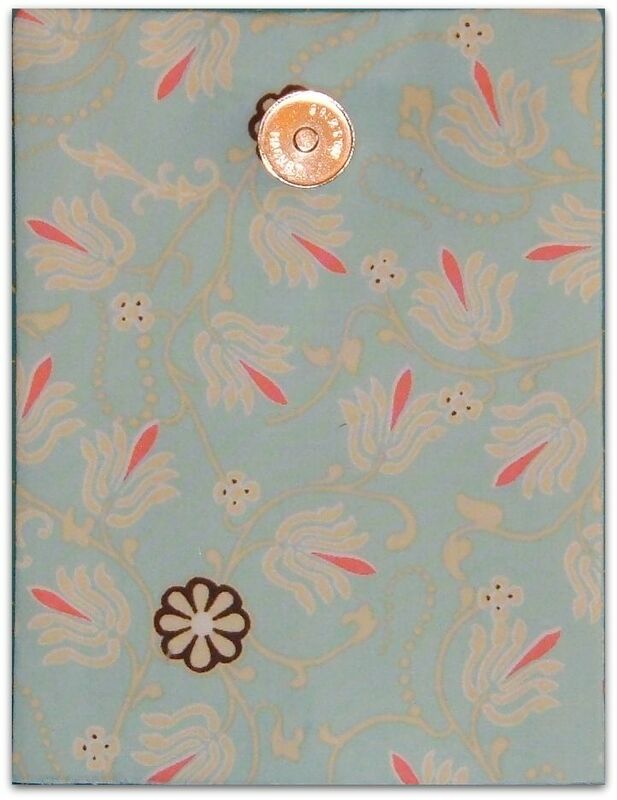 Take snap flap and center it about 2-3″ from top of bag. Snap side down. Step 2- Lift flap and lay washer where other snap will go. Mark cutting lines in washer. Cut through both layers of front pocket. Step 3- Push snap tabs through front of pocket. Put washer over tabs, and fold tabs to the sides. Step 4- Snap is DONE!!! Whew-Hew!! Step 5- Pinning Straps onto bag. On the front of your bag, measure 1 and 1/2″ from edges of front pocket. Pin the strap in place. If you didn’t use D-rings pin the end of the strap to the bag. Don’t get confused here. You are pinning opposite ends of the same strap to the sides of front pocket. (in the picture below it looks like I pinned them different distances….it’s a trick. 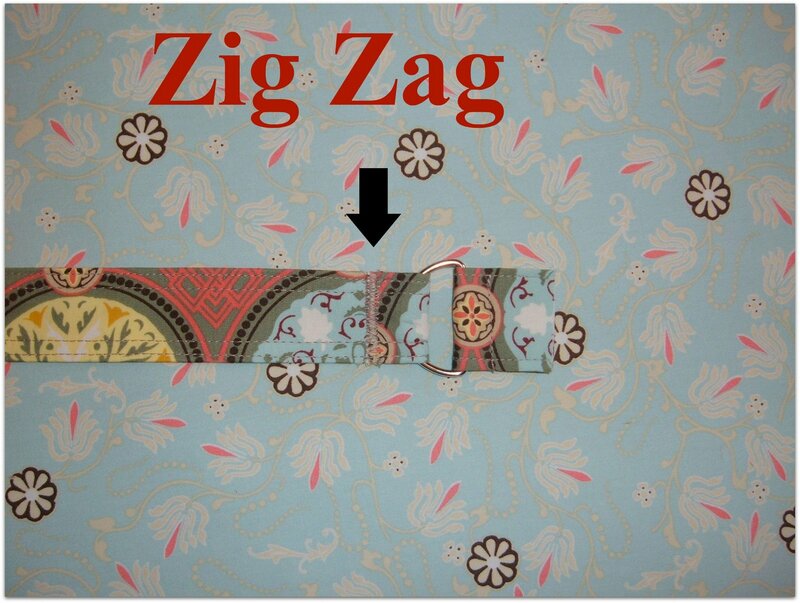 They are both 1 and 1/2″ from pocket edge) Step 6- Flip your bag over to the back side. Center your snap flap with the snap facing up, and pin into place. Step 7- Pin other strap into place by lining it up with strap ends on other side of your bag. Pin those into place. Step 8-***Optional*** Stitch around the top of your bag, at 1/2″, to hold everything in place. Then you can take out all of the pins. Step 9- Lining the bag. Put your the outside of your bag (right side out) into your lining (right side in). 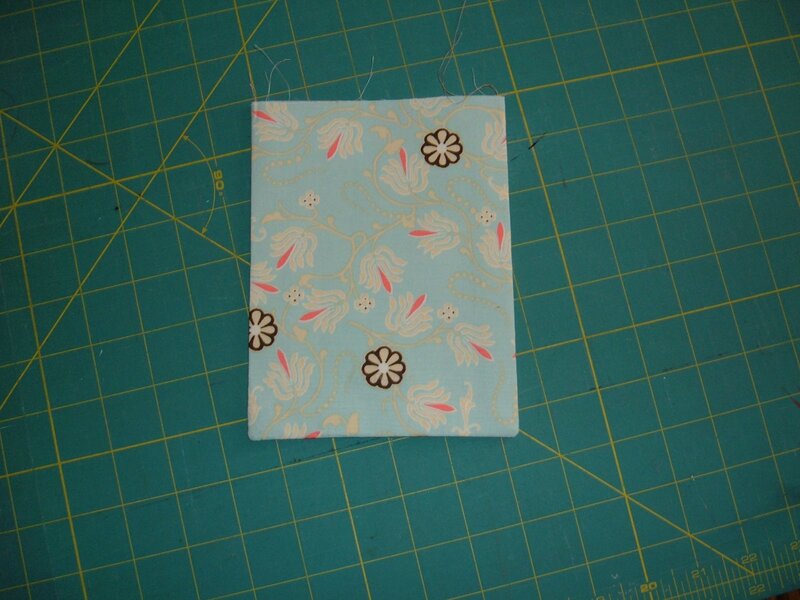 Step 10- Make sure that your inside pocket is in the back, and the blank lining piece is in the front. Step 11- leave an opening, about 6″, on one of the ends of the bag. 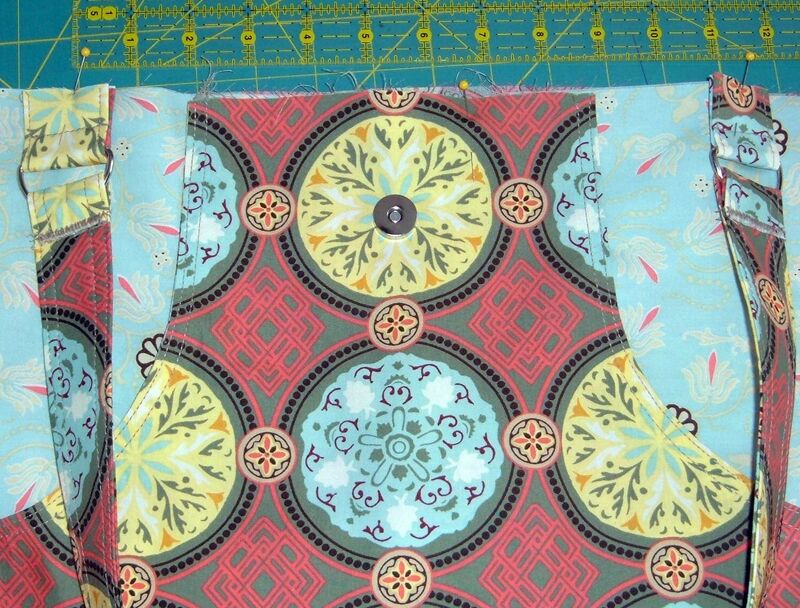 Then stitch around the top of the bags at 1/2″. leaving the opening open. When you come to a thick part go very slowly. If it is VERY thick, then sew right to the edge of the thickness, lift your presser foot and take one or two stitches rotating the wheel by hand. Lower your foot, and sew very slowly. I usually break at least 1 needle because I’m not paying attention, and I go too fast. Step 12- Birth your bag. Pull your bag, and lining out through the hole that you left. Just keep working it out until the whole thing is right side out! Step 13- Tuck the bag lining into the bag. Keep working it around until it looks like a bag above the! Step 14- Iron the heck out of the bag!! Roll the lining of the bag up about 1/4″ above the seam, and press it. (see pic below) You will be able to see the lining peaking above the top of the bag. Step 15- Press opening edges so that they match up with the top edge of the bag. Pin it closed. Step 16- Top stitch around the top of the bag right below seam line. Stitch the opening closed. Give her one more good pressing! She even looks good in snow!! Now, go stuff her full of all of your sunshine necessities…. ps. don’t forget to post your pics on the Gracie Lou’s Flickr group!! Today you will need the rest of your big pieces. 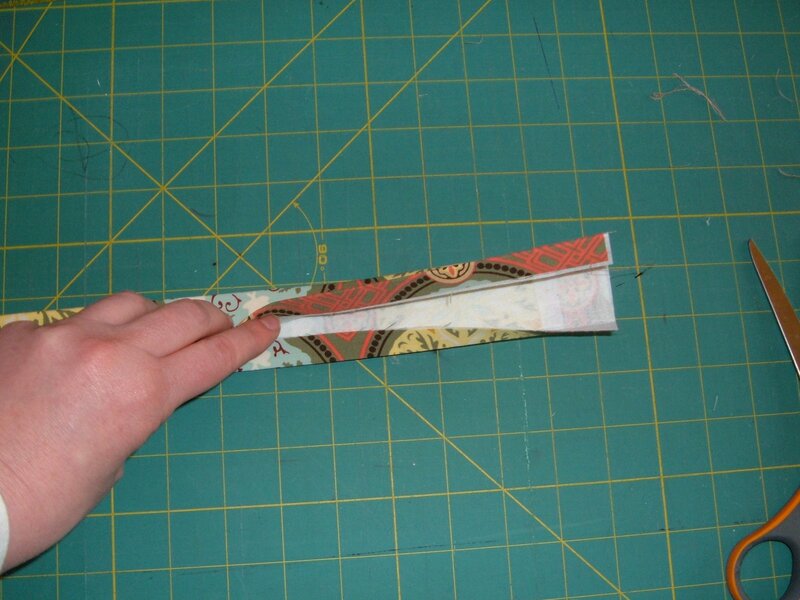 Step 1- With right sides of your Main Purse “A” pieces together, sew curved edges at 1/2″ seam allowance. Clip curves close to stitching line (not THROUGH stitching line. ), and turn it right side out. Step 2-Press curve really well. Make sure that your whole front piece lies flat. 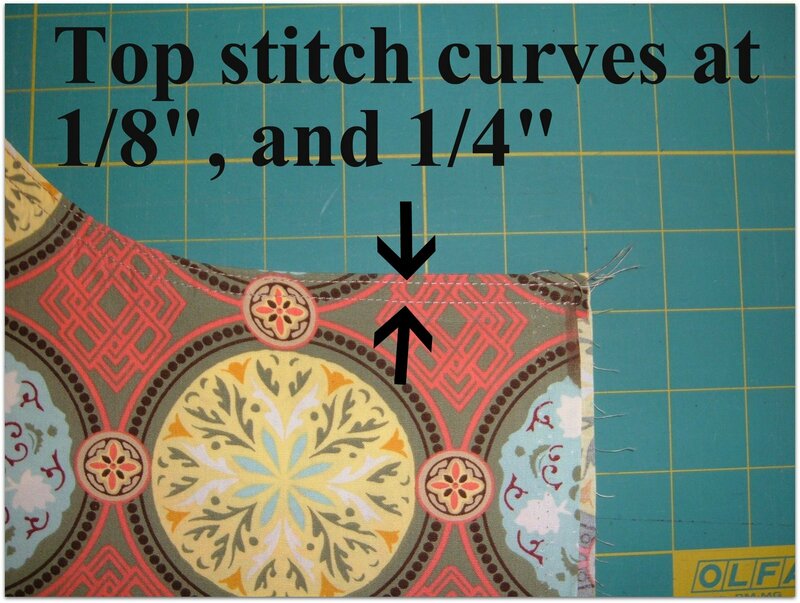 Step 3– Topstitch curves ta 1/8″ and 1/4″. Step 4- Take your Lining “B” piece and lay it face up. Place your completed “Front Pocket” piece on top of it. Step 5– lay remaining bag body piece “B”, face down, on top of this. PIN everything in place. Step 6- Stitch sides and bottom at 1/2″. Step 7– Cut corners away 3 and 1/2 inch from edges. Step 8- Get ready to make your square bottom by matching seam allowances. before you do this make sure that when you open the corner to match the seam allowance, that you have opened it between the 2 outside fabrics (not the lining fabric). Step 9- Sew across corner at 1/2″. Press all seams flat against the bag. Step 10- get your completed bag lining and press side seams flat against the bag. If you feel adventurous, topstitch the seam to the bag. 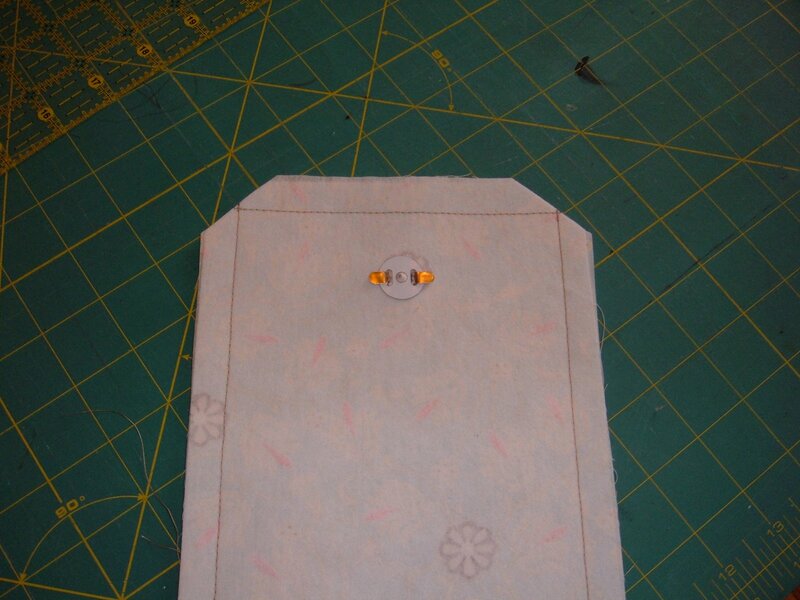 It is a littls tricky…….but it makes the seam allowance lay so much flatter! That is all for today! Tomorrow we will be putting the whole bag together!! This has been so much fun for me. I really appreciate you all for playing along! Big Hug!! Today we are going to work on a lot of little things. You will need your 4 handle pieces and your 2 handle accent pieces. ** If you are going to use D-rings you will need those, and your 4″ x 12″ piece. 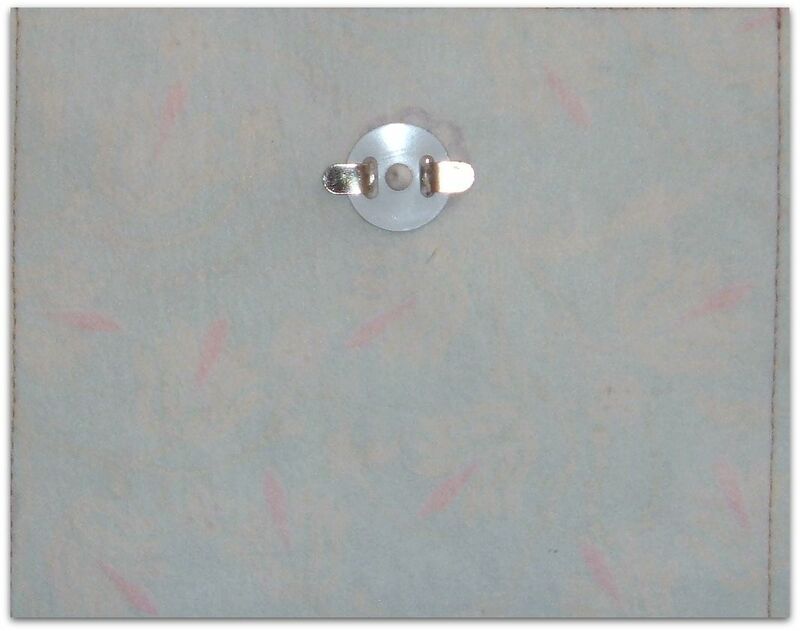 **Step 1– Lay 4″ x 12″ (d-ring strap) piece, wrong side up, on your ironing board. Fold long edges over 1/2″ and press them in place. 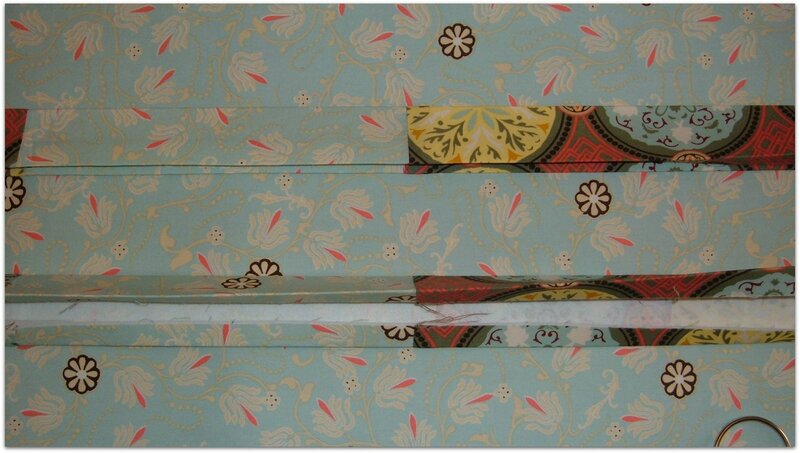 **Step 2- Fold the entire piece in half matching folded edges. Press. 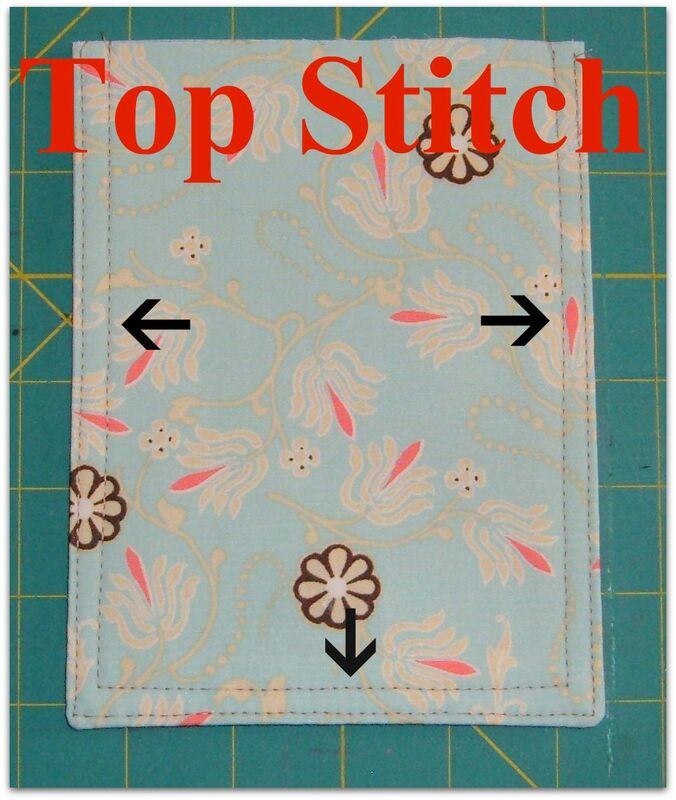 **Step 3– Topstitch down both edges at 1/8″. ** Step 4– Take this “strap” to your cutting board and cut it into four 3″ chunks. **Step 5- Thread each of the 3″ pieces through a d-ring. 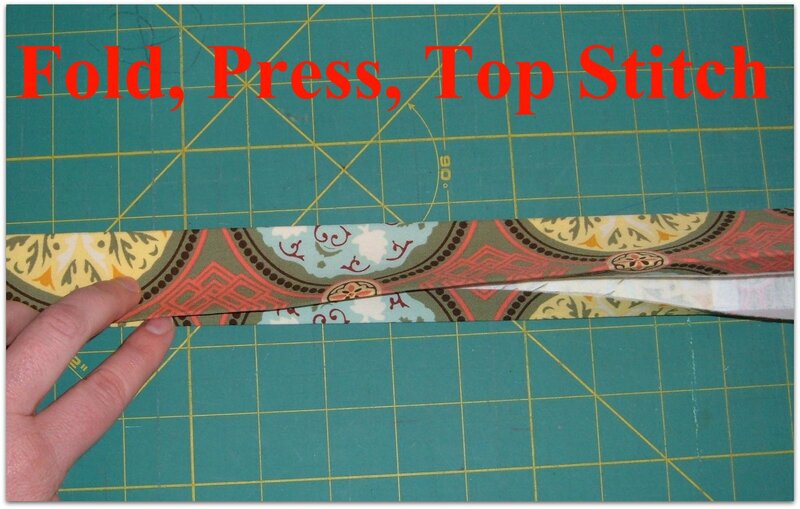 **Step 6– Sew across the strips as close to the D-ring as your presser foot will let you. **Step 7- put your d-rings aside for now. Step 8– Line up you Strap pieces with an accent piece in the middle. Sew them together with 1/2″ seam allowance. Press seams flat. Step 9– Take straps to the ironing board. Lay them interfacing side up. Fold long edges in 1/2″, and press. 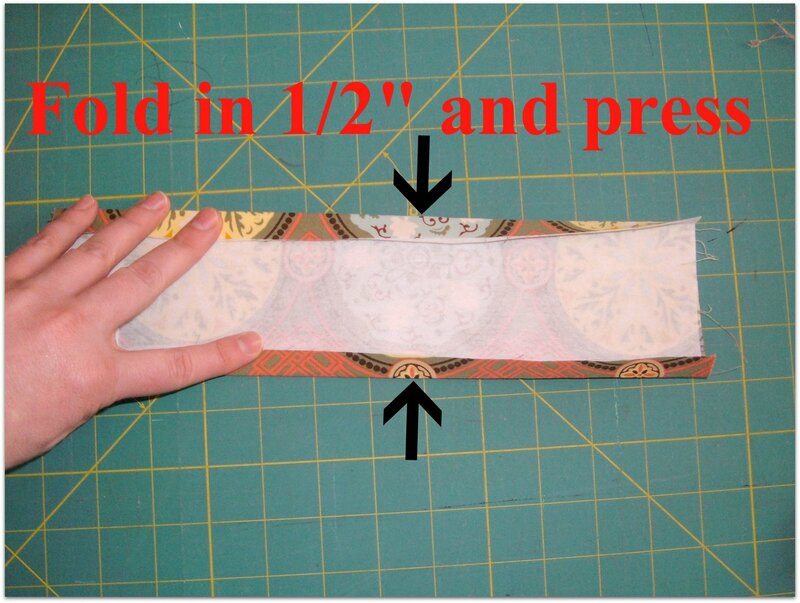 Step 10– Fold entire strap in half, matching folded edges, and press. 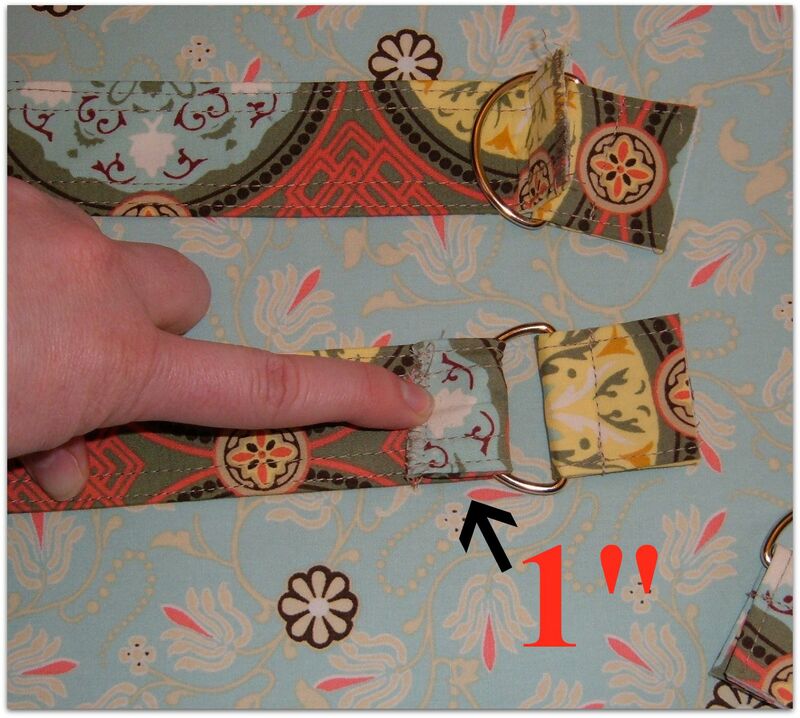 Step 11– Topstitch down both sides, of both straps, at 1/8″ and 1/4″. 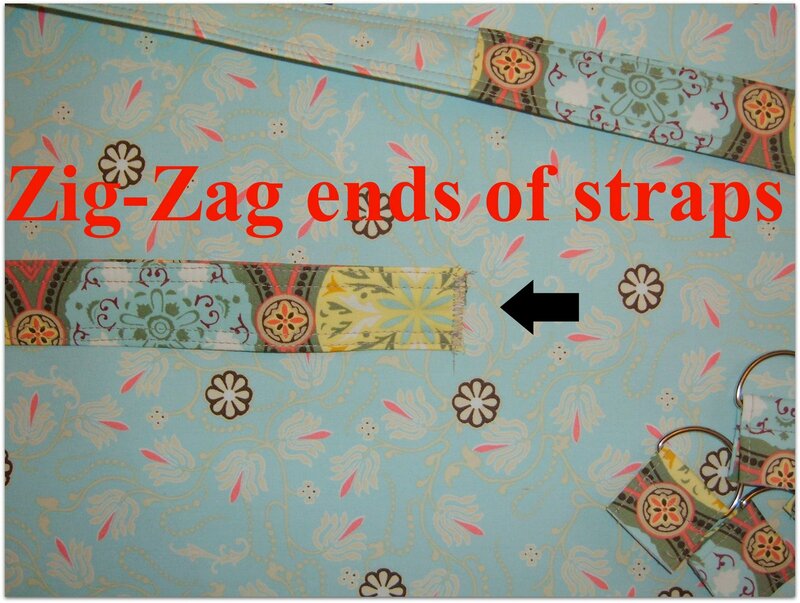 Step 12– Zig-Zag ends of straps to finish the edges. Trim all stray threads. **Step 13– Thread end of strap through D-ring. Fold strap up 1″. Do this with all four ends of your straps! This is all for today! We are half way there…are you getting excited? 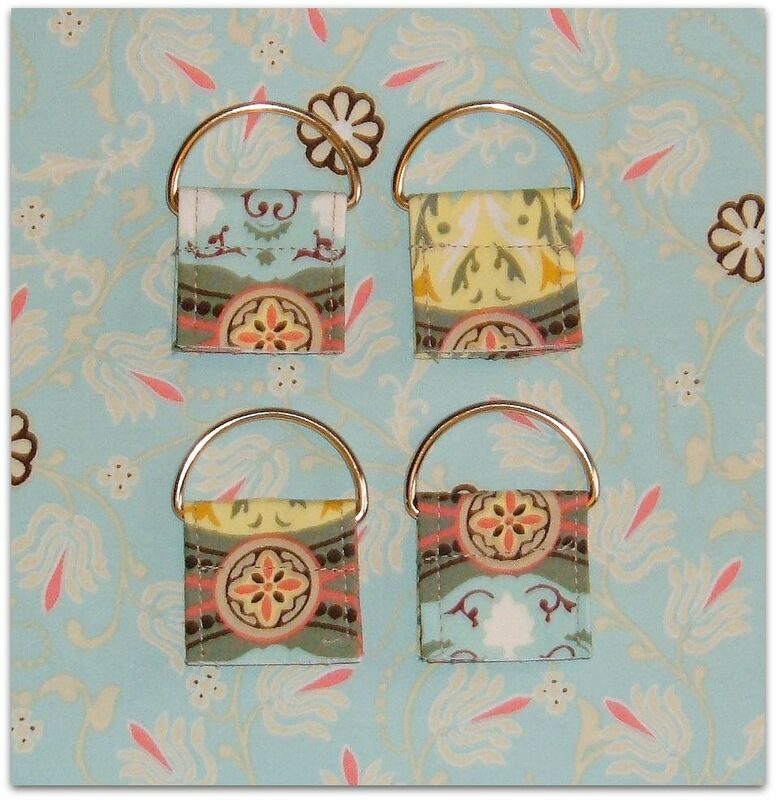 Today you will need both of your 6″ x 7″ flap pieces, and your Magnetic snap. If you’ve put a snap in before, today’s assignment will be easy peasy!! Step 1- Match up your flap pieces with right sides of fabric facing each other. 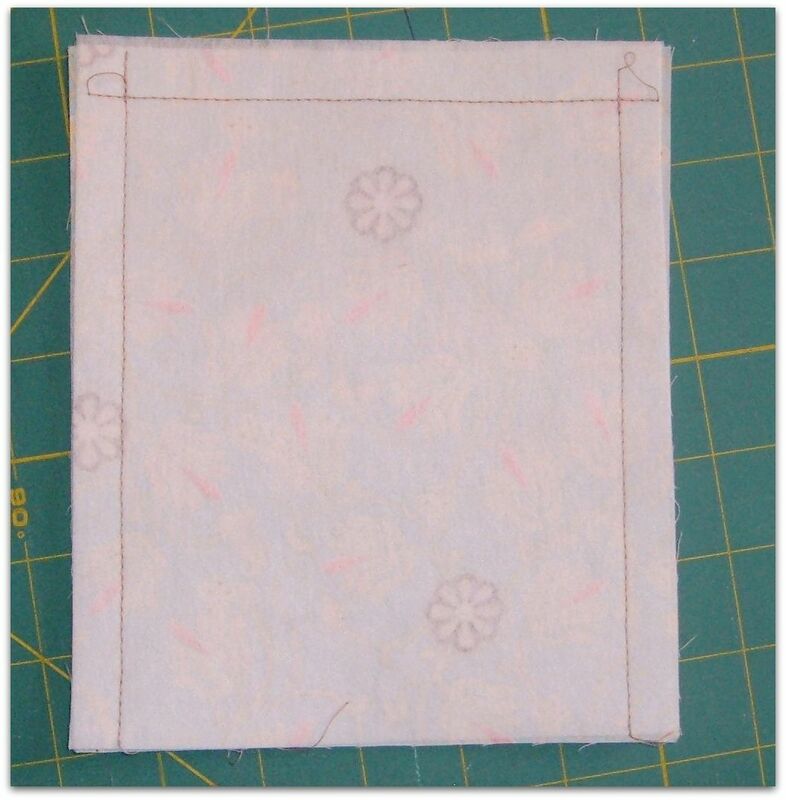 Sew around 3 of the side, 1/2″ seam allowance, leaving one short side open. Step 2- Clip the corners off close to the stitching line. Step 3- We are going to set the “male” side of the snap into the end of the flap. Measure down 1 and 1/2″ from the top edge. 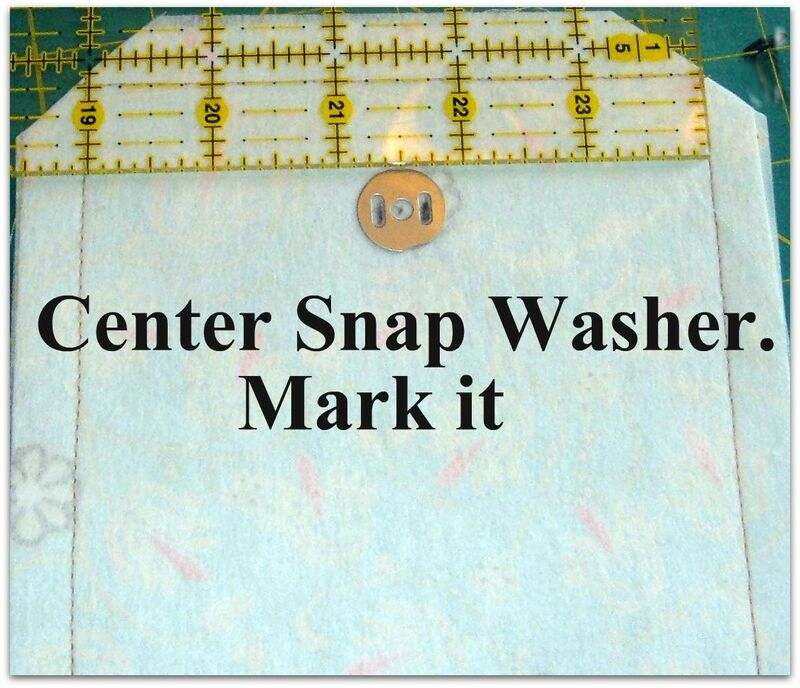 Center the washer below that, and mark openings with a pencil. Step 4- Cut on lines through only one flap thickness. 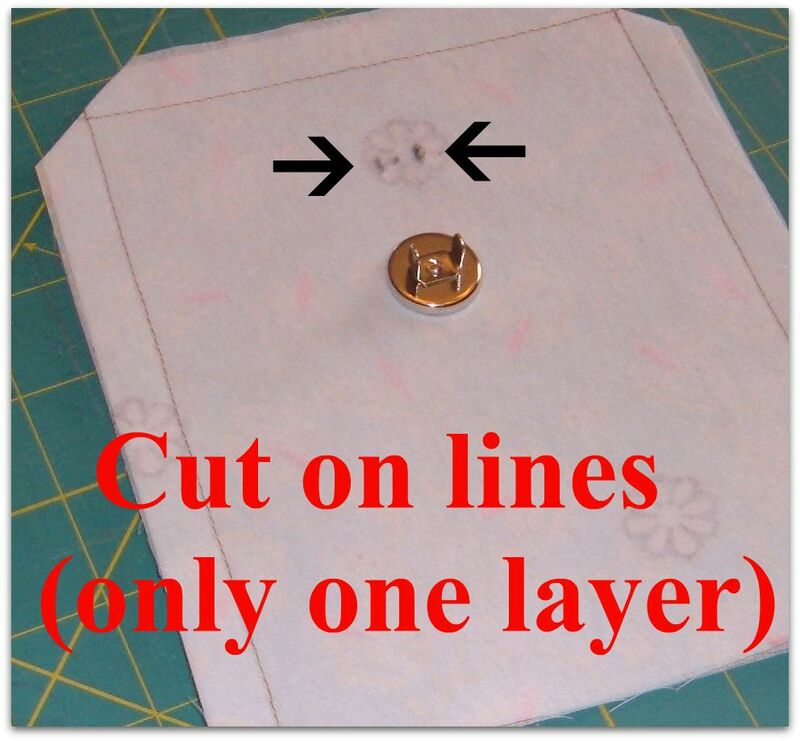 The easiest way to do this is using you seam ripper, but you can do it with your scissors. Step 5- Put the snap inside the flap, and thread the posts through the slits. Step 6- Put the washer over the posts. Step 7- Fold posts to each side. If you can’t do this with your fingers use the side of a spoon. I guess you could use an actual tool from the tool box, but I prefer to do it the quick and easy way. Step 8- Turn your flap right side out. Poke your corners out so that it is nice and square. Step 9- Press the edges of the flap flat. Step 10- Top stitch the sewn edges. I like to stitch at 1/8″, and 1/4″. You are done for today!!! Look at that adorable little snap-flap that you made! 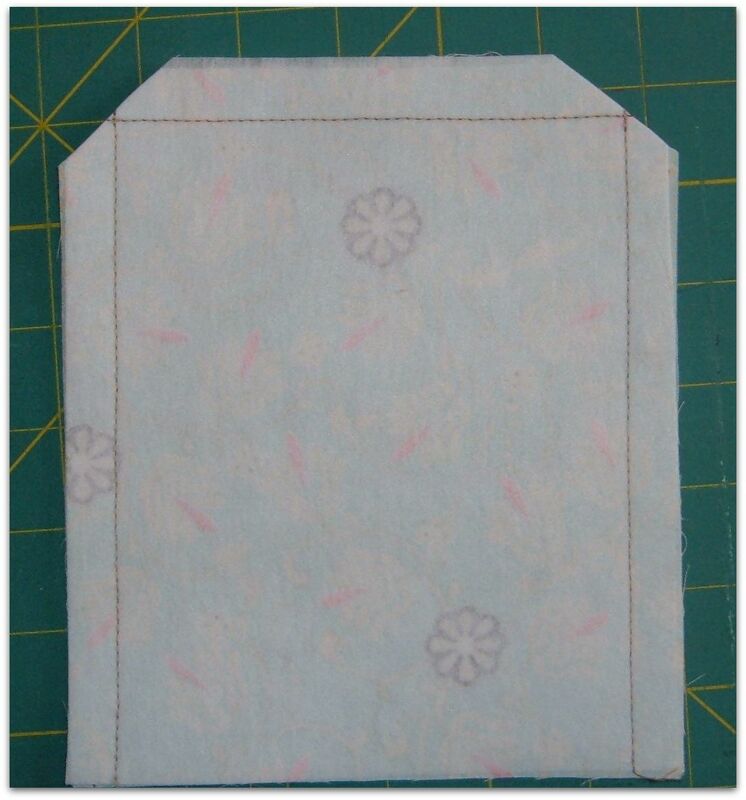 For today’s sewing fun you will need your 8″ x 16″ Pocket piece, and your 2 interfaced lining “A” pieces. Step 1– Start by getting your 8″ x 16″ Pocket piece. Lay it on your ironing board interfacing side up. Fold the edges over approx. 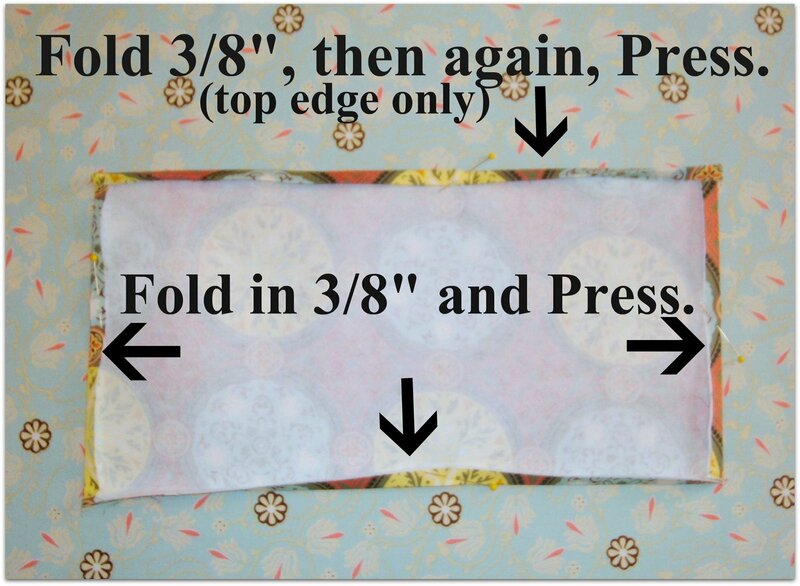 3/8″, and press the fold into them. I used a pin or two to hold them in place. Step 2- Fold top edge over one more fold, and press. Step 3- Take one of your Lining “A” pieces and lay it right side up. Place your pocket on the lining, about four inches from the top edge. You can either center it with the ruler, or eyeball it. Pin the pocket in place. Step 4– Stitch the pocket in place. 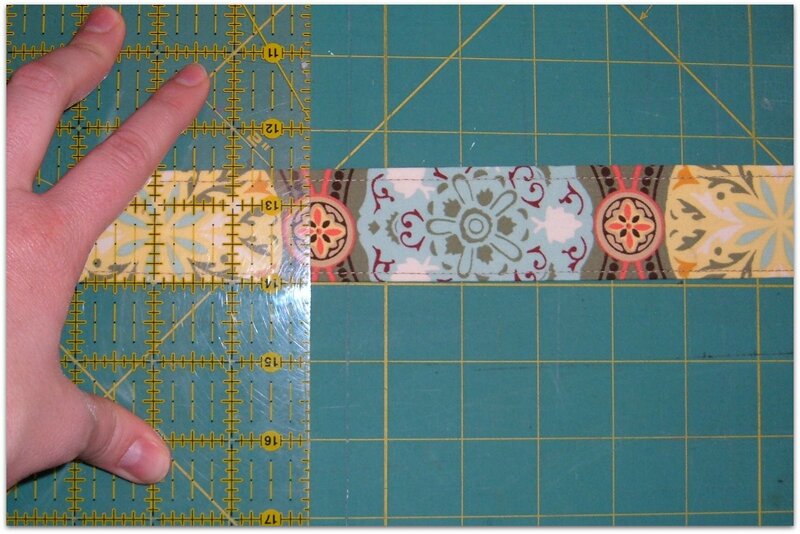 I topstitch, at 1/8″ and 1/4″, around all 3 edges. Make sure to back track a couple of times at the top to secure the pocket. Step 5- OPTIONAL- I divided the big pocket into to smaller pockets by sewing a seam down the center. Yeah!! Pockets on!! Isn’t it cute?? Of course it is. 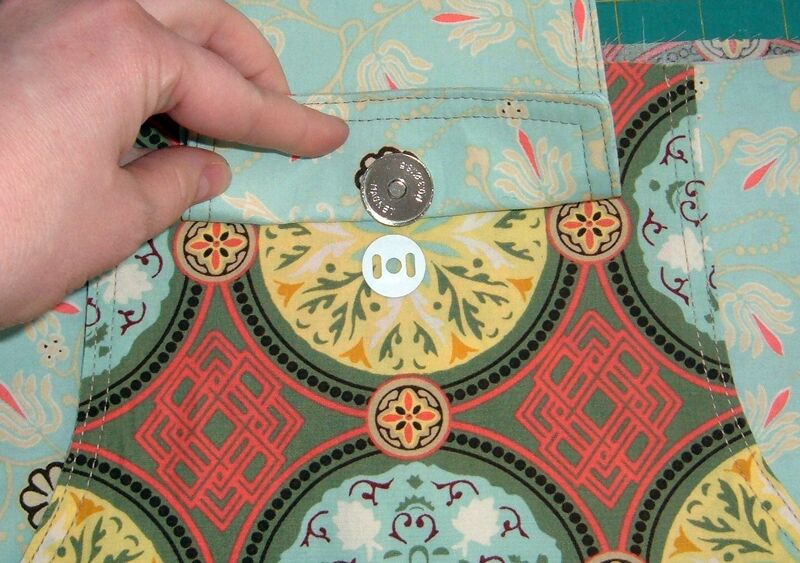 ***If you want to add more pockets to the inside of your purse now is the time to do it, before you go to step 6. Step 6- Stack your other Interfaced lining piece “A” on top of your pocketed piece with the right sides of the fabric together. 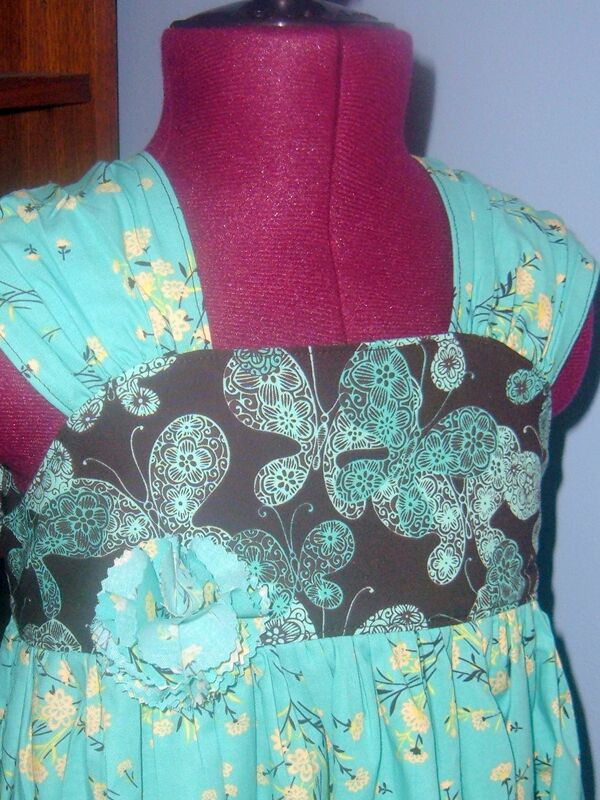 Sew sides and bottom with 1/2″ seam allowance. 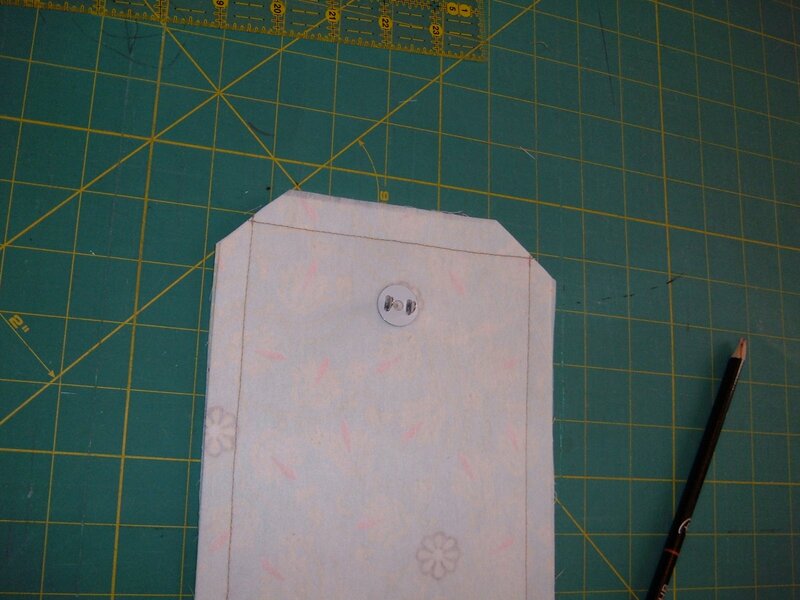 Step 7- Place your sewn lining on your cutting board. We are going to cut the bottom corners out. Measure up 3 and 1/2″ and over 3 and 1/2″ from the edge. Mark this angle with a pencil. Do this to both bottom corners. Step 8– Cut on the lines, and remove the corner pieces. Step 9- Open the corners and fold them so that the seam allowances meet. I know that this may not make sence…..so hopefully the picture will clear it up. Step 10– Pin in place. It helps if you fold the seam allowances in opposite directions. 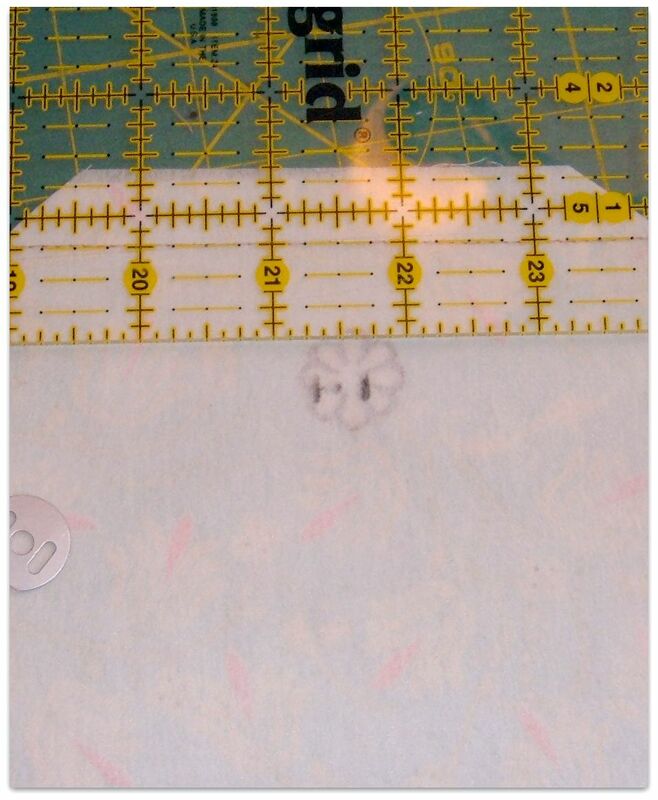 Sew across opening with 1/2″ seam allowance. Now do it again with the other corner, and you are done for today!